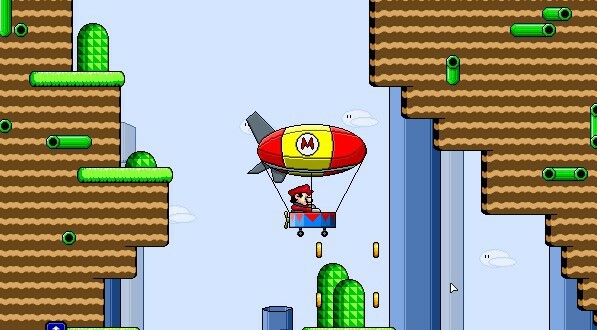 In this game, Mario is on the road with a zeppelin and tries to collect as many coins as he can. Unfortunately, the Zeppelin is not very stable and so you must always make sure that he does not touch anything, and if possible, try to find all the coins in the maze without flying against the walls. The game is played with the arrow keys on the keyboard, and Mario always moves in whatever direction you press. If you have any coins, you can land on the platform at the end and thus come to an overview. At this stage, click on "next" and you can fly right on to the next mission. If you cannot get into a location because it is too narrow, you can fly back up using the arrow key and then look for another way to gain access. At the very end you can always find somewhere on the landing platform which looks just like the place where you started. Mario looks a bit funny in the Zeppelin, but you can still see him quite well. The gameplay is okay, but I would have liked a little more action. With each mission it becomes narrower and more difficult. One can show how good their flying skills are through the game. Mario Zeppelin 2 is a nice little change from the other platforming games in this genre. In some places it is very narrow. Do you like Mario Zeppelin 2? If you like Mario Zeppelin 2, please click on the Facebook Like Button. With help of the likes on games, we generate our top 10 charts.